(MPI) - This is the statement shared by the Minister of Planning and Investment Nguyen Chi Dung at a meeting with the press agencies to discuss the fields under the Ministry’s state management in the year 2018 taken place on January 1st, 2019. At the meeting, assessing Vietnam's economic picture in 2018, Minister Nguyen Chi Dung said that in 2018, Vietnam continues to achieve many outstanding achievements in many fields, especially in the economy. With the Planning and Investment Sector, economic growth of about 7.08 % is the most encouraging bright spot. With a growth rate of 7.08%, it is almost certain that we will reach the average target of 6.5% for the 5-year period 2016-2020. Compared to the international and regional level, this is a very positive increase. However, an extremely heavy task is to maintain this high growth momentum for a long time to head toward a longer-term goal, especially the goal of vision until 2035. Through the synthesis and analysis, the growth of 7.08% is a comprehensive result of all sectors and fields. In particular, on the supply side, it is a steady growth of all three sectors of agriculture, industry and services, especially agriculture. On the demand side, export increased strongly, the trade surplus of goods reached 7.2 billion USD, if including services, the trade surplus reach 3.5 billion USD, investment increased higher than in 2017, accounting for 33.5% GDP, consumption increased steadily during the year, always at a 2-digit level. In terms of contributing factors, it can be seen that the labor factor increased as compared to 2017, adding about 500,000 workers, price factor and total factor productivity (TFP) also improved. However, the concerning issue is the risks of 2019. With the vast openness of the economy nowadays, our economy will be greatly affected by external factors. All international organizations forecast global growth in 2019 to be modest, even slowing down. Therefore, even though the result in 2018 is very positive, we should not be too optimistic, but we must always be ready to utilize every opportunity to accelerate the growth rate with the view that 2019 is a breakthrough year to successfully reach the goal of 5-year Plan, Minister Nguyen Chi Dung shared. 2019: The motto of action "Discipline, integrity, action, creativity, efficiency, breakthrough"
In order to achieve the targets set out for 2019, Minister Nguyen Chi Dung said that the Ministry of Planning and Investment submitted to the Government for the promulgation of Resolution No.01/NQ-CP on tasks, main solutions to implement the Socio-economic Development Plan and State Budget Estimate for 2019. The resolution is a comprehensive document showing the solutions that need to be done to fulfill the targets of the 2019 Plan. With the meaning of the year to accelerate the growth rate successfully reach the goals both in terms of 10-year strategy and 5-year plan, 2019 is a "breakthrough" year to develop with the main focus on executing, directing three main contents. The first is enhancing internal capacity, reinforcing the macro foundation, maintaining and clearing the growth’s driving forces; drastically implementing strategic breakthroughs, restructuring the economy, renewing the growth model, accelerating the science and technology application, innovation and start-up. The second is creating a favorable investment and business environment, focusing on completing the institution, improving the quality of law construction and enforcement; tightening discipline, administrative and civil rules; focusing on administrative reform, building an e-Government in association with rearranging, organizing a fine, efficient, effective apparatus; innovating and enhancing the effectiveness of judicial activities. The third is comprehensively and harmoniously developing cultural and social fields, improving people's lives in association with the Anniversary of 50 years of Implementing President Ho Chi Minh's Will, enhancing resource management, environment protection, disaster prevention, climate change response; consolidating national defense and security, firmly protecting the independence, sovereignty, unity, territorial integrity, ensuring political security, social order and safety, promoting foreign affair and international integration. Since the beginning of the term, we have had many proper policies and solutions on socio-economic development. The most important thing is that we need to thoroughly implement the proposed solutions which are still efficient and effective. The proposed solutions are very comprehensive, practical and long-term. With limited resources, the solution should not be spread and scattered, Minister Nguyen Chi Dung emphasized. 2018 also marks 30 years of foreign direct investment (FDI) attraction in Vietnam, Sharing on this issue, Minister Nguyen Chi Dung says that after 30 years of implementing the open and integration policy, the FDI sector has become a crucial part of the economy, a dynamic development sector, significantly contributing to the socio-economic development of Vietnam. As of December 20th, 2018, the whole country had 27,353 valid foreign investment projects, with a total registered capital of 340.1 billion USD and a total realized capital of about 188.8 billion USD. However, in the FDI attraction still exist some limitations. For example, the linkage and productivity spillover effect of FDI sector to the domestic sector in the country remains low, many FDI projects focus on processing and assembling stages. The localization rate in some industries is below average. Technology transfer through FDI has not achieved the expected results. The number of FDI projects in industries using high-tech technology, creating great value added is not much. Some FDI enterprises have not strictly complied with the provisions of the law on environmental protection. Some FDI enterprises show transfer pricing behavior, dishonesty in reporting financial statements to evade taxes. According to Minister Nguyen Chi Dung, Vietnam is in its final years of implementing the Socio-Economic Development Strategy Period 2011-2020 and preparing to develop the Socio-Economic Development Strategy Period 2021-2030.To perform development goals and create new driving forces to promote growth basing on productivity growth, to overcome "low wage traps", "low value traps", "low technology traps" and "middle income traps”, the orientation to attract and use FDI must ensure quality, effectiveness and sustainable development, encouraging creative innovation and close linkage between FDI and domestic enterprises. Sharing on the meaning of the Vietnam Reform and Development Forum (VRDF), formerly the Consultative Group Meeting (CG) and Vietnam Development Forum (VDF), organized by the Ministry of Planning and Investment for the first time in 2018 in the context of Vietnam becoming a middle income country and the current various fluctuations of the world's trade, Minister Nguyen Chi Dung said, through VRDF, Vietnam is more proactive in exchanging, consulting opinions from development partners, national and international experts, policymakers for socio-economic development, enterprises community, etc., the people who are really interested in the development of the country and desire to exchange and discuss openly and frankly to propose solutions and practical actions to quickly transform into the Government's development and reform policy actions. VRDF 2018 focuses on issues of global trends, development vision of Vietnam in the coming time and two development driving forces: Creative Innovation on the Industry 4.0 Platform and Development of the Private Economic Sector. The forum has received many contributing comments from the domestic and international community and also recommended many solutions and actions of the Government and the subjects in the society to promote these driving forces for the new development period, towards realizing Vietnam's aspirations. These valuable contributing comments are even more meaningful at the present time. Vietnam is actively preparing a socio-economic development plan for 2019, and the formulation of the Socio-Economic Development Strategy 2021-2030 and the Socio-Economic Development Plan 2021-2025. The Forum's recommendations will be considered in the process of developing important documents for the country's development. The year 2018 also continues to mark the first time the Ministry of Planning and Investment has initiated and coordinated with ministries, branches and localities to organize an event for 100 young Vietnamese intellectuals abroad to join the Program of Connecting Vietnam Innovation Network 2018. 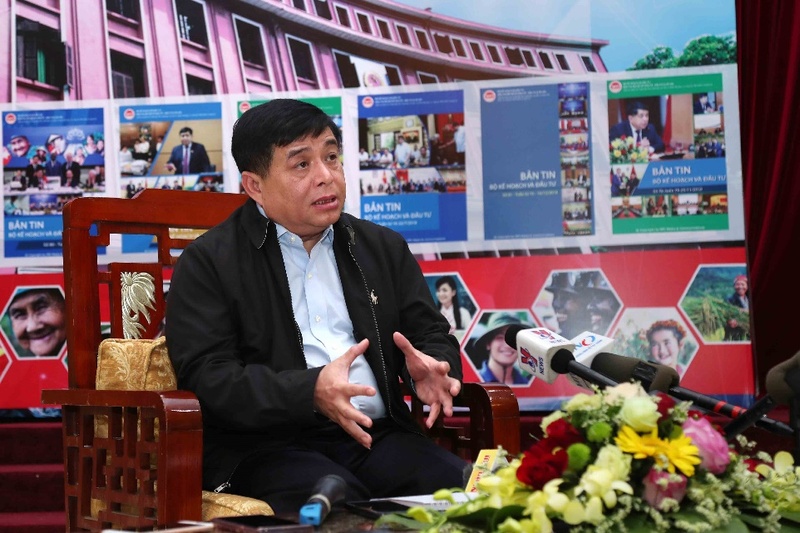 Sharing on this issue, Minister Nguyen Chi Dung said that in order for Vietnam to successfully implement the 4.0 Industrial Revolution, we need to gather the intellectual power of Vietnamese people all over the world to quickly upgrade Vietnam's technological capabilities. The purpose of Vietnam Innovation Network is to connect domestic research institutions with research centers, experts, and the latest technological achievements in the world through Vietnamese experts who are currently studying and doing business all over the world. The event of the Program of Connecting Vietnam Innovation Network 2018 has delivered many encouraging results. Many scientific conferences on the technological fields of the Industrial Revolution 4.0, such as artificial-intelligence, universal internet, digital finance, have been organized with the participation of Vietnamese experts inside and outside the country. The conferences have helped us to access the latest technology trends, and also provided many useful policy recommendations for Vietnam to quickly grasp and develop these technologies. This event also helps many large Vietnamese enterprises to contact and exchange technology with Vietnamese experts. Many specific cooperation projects have been exchanged and cooperated between enterprises and technology experts. This event shows that the technical capacity of Vietnamese people is tremendously significant, creating the foundation and belief in the ability of Vietnam to successfully implement the Industrial Revolution 4.0 with a suitable roadmap and priority. In addition, this event is also a message from the Government to overseas Vietnamese and technology experts, technology companies around the world of a dynamic Vietnam actively developing technology to innovate the growth model, with an abundant technology team, an attractive investment destination for new technology industries. 2018 marks the first time the Ministry of Planning and Investment has organized an online conference with localities to assess the socio-economic situation in 2018 and formulate the socio-economic development plan 2019. The most important motivation pushing the Ministry of Planning and Investment to organize an online conference is the determination to innovate and reform of the Ministry and the whole Planning and Investment Sector. The Ministry has made many successful innovations and reformations, the most outstanding success is the reform in formulating the annual plan. Localities no longer have to spend a considerable amount of time and expenses to gather at the Ministry for the meeting to plan. Instead, there are only 3 to 4 meetings by region, through that, localities will have opportunities to meet, exchange and sharing to unify and agree on the work in planning. On that platform, the Ministry has taken a step forward, which is to organize an online conference with localities, the conference became a real forum, conveying the contents of orientation, policy and law from the central level as well as receiving opinions, suggestions and petitions of localities, organizing direct, quick and effective answers to all localities' opinions. Minister Nguyen Chi Dung shared. The biggest result from the 2018 Online Conference is not only to help to formulate the 2019 plan and to complete relevant reports in the best way but also to create a new way of working, a routine in organizing effective conferences, seminars, information exchange, etc. Along with the development of information and communication services, we can fully implement online conferences at a low cost, saving a large amount of state money. It is expected that in 2019 the Ministry of Planning and Investment will continue to organize online conferences, in which, a conference summarizing 2018 and deploying the plan for 2019 is the first conference of 2019. Minister Nguyen Chi Dung affirms that the Ministry of Planning and Investment is always determined to take the lead in innovation, reformation; all innovation policies are based on the benefit the people, for the safer and better life of the Vietnamese people, in a joint effort to ensure no individual is left behind./.